Commander Eric Tufnell RN (1888-1979). Watercolour annotated HMS FIJI 22.5.41. HMS FIJI was the first of the light cruisers of the Colony Class to be launched in May 1939. Some 35 feet shorter than the Southampton Class but mounting the same main and secondary armamant as these ships, the Colonies proved popular in service and were widely deployed by the Royal Navy in all theatres of World War 2. As units of the Mediterranean Fleet and heavily involved in the evacuation of British forces from Crete in May 1941, both HMS FIJI (Captain P William-Powlett RN) and HMS GLOUCESTER (Captain H A Rowley DSO RN) were subjected to especially intense air attack by the German air force: with inadequate air cover themselves both cruisers fought off the attacks valiantly but both finally succumbed. FIJI was first heavily damaged by a bomb dropped close to port which led to severe flooding, loss of power and then an inablity to steam. Dead in the water, at least 3 direct bomb hits then followed and with her anti- aircraft ammuntion all but exhausted (this was GLOUCESTER's fate too) the outcome was inevitable and later that evening the cruiser rolled over to port and sank. Some 240 of her ships company were lost. 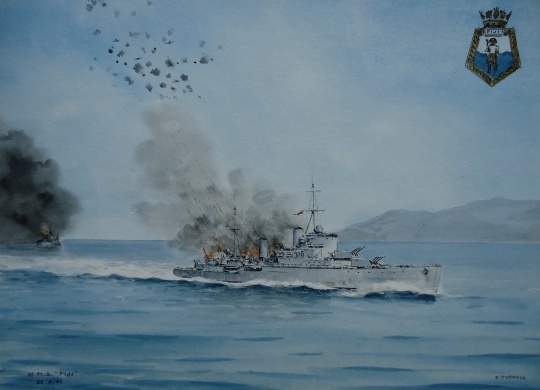 This watercolour by Commander Eric Tufnell records FIJI's last fight: still shooting and steaming for her life and with battle ensigns streaming, the cruiser has yet to be damaged by that first bomb which fell to port. Although her 6 inch guns are elevated it is doubtful if Captain William-Powlett was able to fire them against the incoming air raids. A paired watercolour of HMS GLOUCESTER by Tufnell, showing the cruiser in happier times, is also available.